HD Kumaraswamy has been on a bumpy road since he became a chief minister on May 23, heading the coalition government, confronting wranglings over portfolio allocation and presentation of the budget. "There are some Congress leaders who are tormenting him. I won't disclose the names. Those who are not able to digest the (Congress-JDS) coalition government are simmering from inside and are giving trouble to Kumaraswamy," said former assembly speaker Mr Koliwad, while reacting to Mr Kumaraswamy's emotional breakdown. 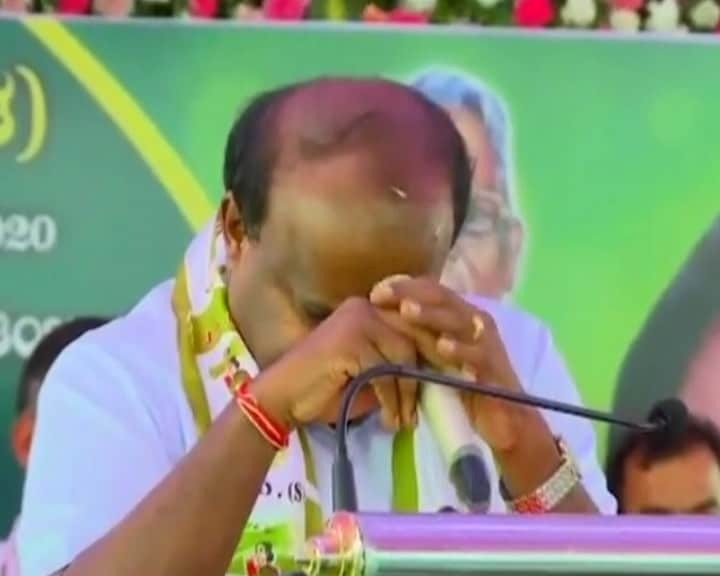 Reflecting strains in the JD(S)-Congress coalition government in Karnataka, a teary-eyed Mr Kumaraswamy had told a meeting of the JD(S) workers here on Saturday that he was "not happy" being in the top post and was swallowing the pain like 'Vishakantha' (Lord Shiva), who drank poison. Asked whether he was referring to former Congress chief minister Siddaramaiah, Mr Koliwad said he would not reveal the names. "Let people think whom I am referring to," he said. "Mallikarjun Kharge (opposition Congress leader) and (deputy chief minister) Parameshwara have supported this government. It is up to the people to decide who is creating trouble for Kumaraswamy," Mr Koliwad told reporters. His remarks are being interpreted in political circles as a reference to Mr Siddaramaiah, whom he had openly attacked, blaming his "dictatorial attitude" for the defeat of the Congress in the recent Assembly polls in the state. Mr Koliwad reminded the Congress leaders that the government, led by Mr Kumaraswamy, was formed on the directions of the party high command. He said he firmly believed that the Congress-JD(S) coalition government has to run successfully and all the Congress leaders need to support it so that the two parties win the maximum number of seats in the Lok Sabha polls next year. Mr Kumaraswamy has been on a bumpy road since he became a chief minister on May 23, heading the coalition government, confronting wranglings over portfolio allocation and presentation of the budget. In his government's first budget on July 5, Mr Kumaraswamy, who also holds the finance portfolio, had unveiled a Rs 34,000 crore farm loan waiver, and later announced an additional crop loan waiver of Rs 10,700 crore from cooperative banks. Recently, Mr Siddaramaiah, who is also the head of the Congress-JD(S) coordination committee, in a letter to Mr Kumaraswamy, had pressed for withdrawing the hike on petrol and diesel prices and reduction in the supply of rice under the 'Anna Bhagya' scheme meant for the poor.